This is a classic badge for meetings. Avoid marring or damaging clothes by using the Clip Style holder at your next event. The holders can easily attach to a blouse pocket or suit jacket and can conveniently be reused, if needed. No pins or adhesives - just a swiveling clip that allows the wearer greater versatility. Comes complete with Laser/Ink Jet inserts. Made from PVC-free material. Top loading clip style design. Built-in templates in Microsoft Word and Corel WordPerfect. 4 x 3. 96/BX. Hi, I'm John with C-Line, and today we're going to talk about our Clip Style Name Badge Holder Kit. This kit comes complete with everything you need to create customizable clip style name badges. The holder is secured with a swiveling clip for greater versatility, and the permanently attached alligator clip will not tear or mar your clothing. Attach badges to your belt loop, pocket, lapel, shirt and more. The holders are punched so you can even wear them with a lanyard. Inside the box you'll find badge holders as well as inkjet laser insert sheets. The PVC-free poly holders are top-loading and sealed on three sides so your badge won't fall out. You can design your own inserts using C-Line's downloadable templates or use the preset layouts available in Microsoft Word and Corel WordPerfect. After printing your inserts, simply tear apart at the perforations and slide them into the badge holders. Additional replacement inserts are sold separately so you can use your badge holders over and over again. 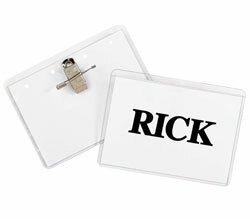 Attach badges virtually anywhere with C-Line's Clip Style Name Badge Holders. Order yours now! That's all we have for today. I'm John with C-Line. Thanks for watching.